Another long-time tradition is our annual holiday dinner/dance, the Jingle Bell Ball, held early in December and beginning the yuletide season. 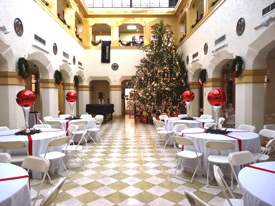 With the elegant surroundings of the historic Thomas Center decorated in its Christmas dress, guests spend a grand evening enjoying a lavish dinner with cocktails, and then dancing the night away to the music of an excellent band. This festive celebration is not exclusively for our membership; the general public is cordially invited to attend. Thomas Center Associates organizes a tour of homes in the Duckpond neighborhood every two years in odd numbered years as a fundraiser for the many TCA projects. Beginning with the 2019 tour, this tour also includes a focus on some aspect of the history of the Thomas Center itself. 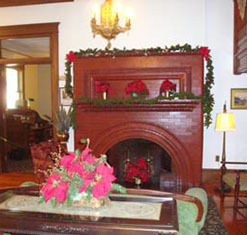 The 2019 tour will feature the Thomas Center as it was when it was the home of W.R. Thomas, his wife Kate and their 5 children from 1910 until 1925. During that period, the home was known as Sunkist Villa and included 21 rooms built around an open atrium. Many of the architectural details of the home remain evident today. The 2019 tour also includes 6 other homes in the Duckpond neighborhood and all are excellent examples of older homes adapted well for modern life. The Thomas Center Associates assists the City of Gainesville Parks, Recreation and Cultural Affairs staff in various ways. For example, each year the Alachua public schools’ art departments are featured with students’ work being displayed and a reception open to the public is held. Traditionally our organization provides refreshments for this event.